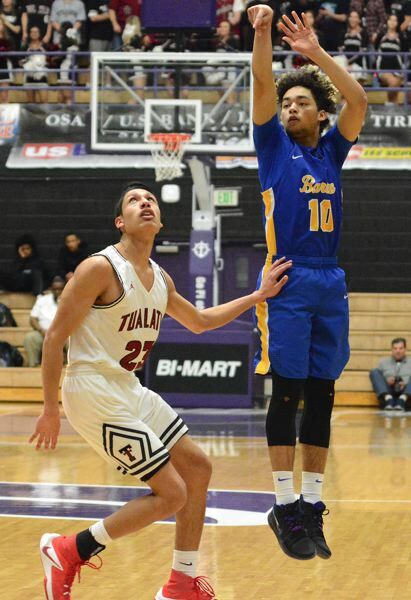 The Bruins rely on the three-point shot to beat Tualatin and advance to the semifinals. No matter who is on the floor for Barlow, it is imperative for the opposing team to guard the 3-point line when they play against the Bruins. Tualatin learned that the hard way on Thursday night. Barlow went 15-of-28 (.535) from downtown in their 69-66 quarterfinal victory against the Timberwolves. Anyone who has watched this Barlow team play at any point in this season knows that this is no surprise. 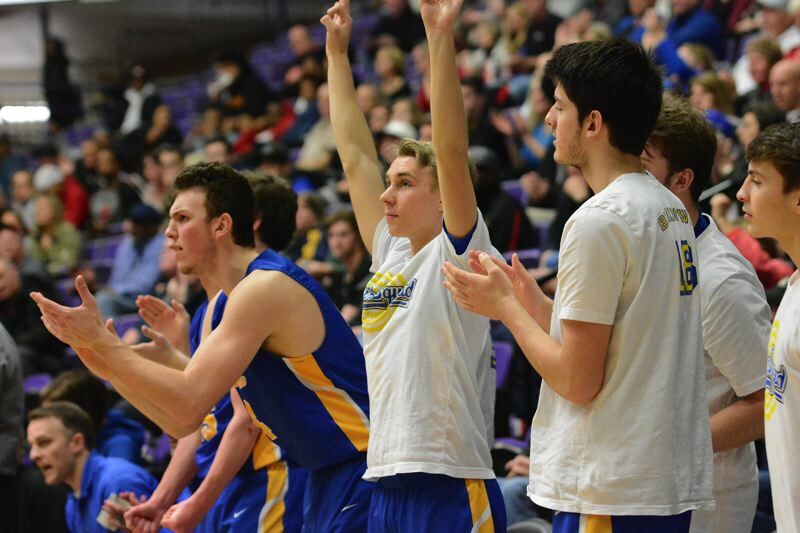 Each player in Barlow's eight-man rotation shoots the 3-ball at a high clip, making the Bruins one of the hardest teams in the state to defend. "It's been huge for us all year. Our kids have spent a lot of time in the offseason working on their deep shots," Barlow head coach Tom Johnson said. "Sometimes you live by the 3 and sometimes you die by the 3. That's kind of what we do." The Bruins came out firing from beyond the arc right off the bat with four of their first five shots coming from distance. Even though Barlow only started 1-of-4 (.250), they began to heat up later in the period. 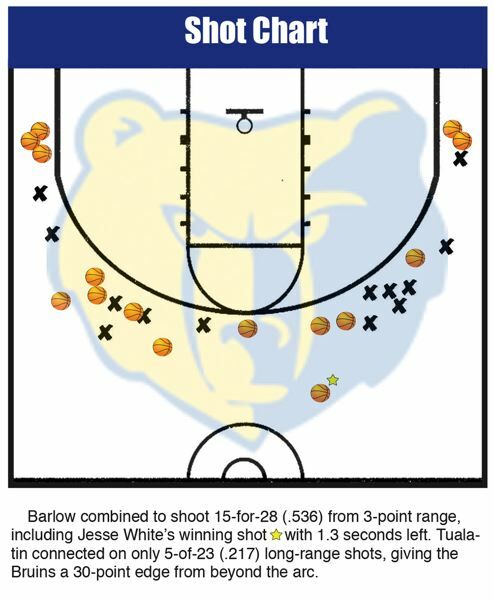 Barlow finished off the quarter hitting their next seven shots from downtown — putting them at 8-for-11 (.727) shooting from distance in the first eight minutes. Five of those triples came off the hand of star sophomore Jesse White. Despite getting outscored in the paint 14-2 in the first quarter, the Bruins still held a 27-26 lead. "My teammates were instilling confidence in me the whole first quarter," White said. "I might have taken some questionable shots, but my teammates kept saying that they were good shots for me." The Bruins cooled down quite a bit in the second period, missing their first five treys. 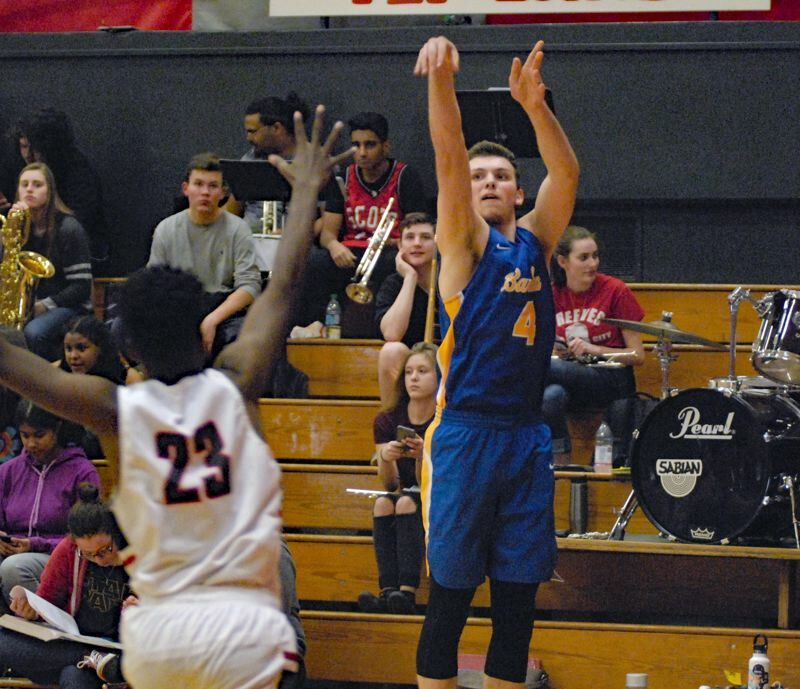 But they were able to get back on track thanks to back-to-back 3-pointers from Evan Inglesby and Daello Portin-Chapman, which gave them a 41-40 halftime advantage. The Bruins finished the first half 10-of-19 (.526) from downtown while just going 5-of-14 (.357) from inside the arc. White was the one that got hot in the first quarter, but it ended up being Cole Edmondson that would carry this Barlow team offensively to open up the second half. The senior guard knocked down a pair of triples from the corner and then followed with a layup to give him eight straight points. Portin-Chapman would follow suit with a 3-pointer of his own moments later. Edmondson finished the quarter with 14 points, including a baseline triple at the buzzer to put Barlow up 60-54. The Bruins were 4-of-7 (.571) from behind the line in the period. "We have eight people on this team that can come in and knock down shots with confidence. It's great to be able to lean on other people if other guys aren't hitting," Edmondson said. "I give all the credit to Jesse. I was hanging my head a bit at halftime, but he told me to keep shooting and he kept getting me the ball." The Bruins strayed away from their usual strategy to begin the final quarter, taking six of their first seven shots inside the arc. This change of pace would prove to be unfruitful as Barlow went more than half the quarter without registering a point. Inglesby finally got the Bruins jumpstarted with a pair of free throws with 3:45 to play, and senior Austin Forrar would hit the first field goal of the period on a driving layup for a 64-61 lead approaching two minutes. But with the game on the line, Barlow would return to what had made them successful all season. Tualatin tied it up at 66 apiece with 49 seconds left, but on the ensuing Barlow possession, White came off a screen by Dominic Jacoby and knocked down a deep 3-pointer with 1.3 seconds left to seal the victory for the Bruins. "(Jacoby) set a great screen and after I shot it, I don't remember much else," White said. "I just remember hearing the crowd go crazy." Tualatin outscored Barlow 32-10 in points in the paint, and out rebounded the Bruins by 16 — two stats that are not exactly a recipe for success for most teams. But the Timberwolves only shot 5-of-21 (.217) from distance, giving the Bruins a lopsided 30-point advantage with the long ball.